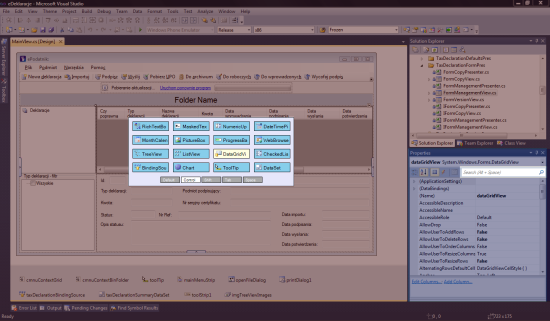 RapidDesign is a Visual Studio extension. 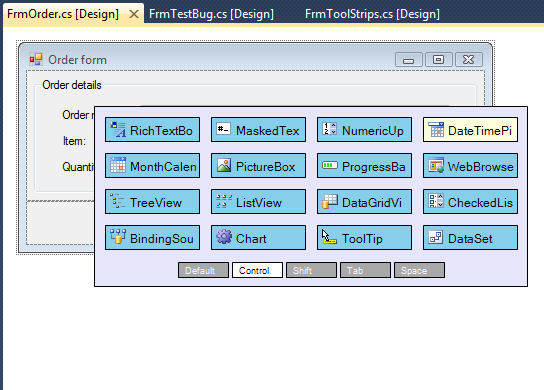 Thanks to RapidDesign working with Visual Studio is much faster and more pleasant. RapidDesign consists of two very powerful tools that help you focus on you goal and forget all about mindless browsing through the toolbox and property grid. RapidDesign is great for new users and also for power users that like to use the mouse and keyboard to the fullest. 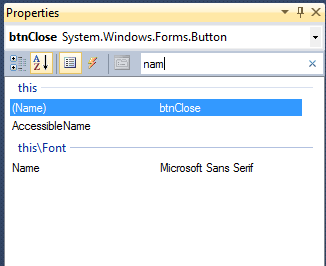 Working with RapidDesign makes you discover Visual Studio designers once again. Property grid search lets you find a property or event in just a few keystrokes. It places itselt right above the property grid. You can select it with your mouse or by pressing (ALT + Space). As soon as the property grid search is selected, it displays all the modified properties of events of the active component. This feature helps you find out which of the properties have actually been changed, to quickly understand the component behaviur. As soon as you type, all of the properties that match your search string are displayted. You can immediately select them in the property grid by pressing the Enter key or by clicking the match with your mouse. After the match have been selected, you can immediately set the property value, or hooko up an event handler. If the property has a custom editor, you can open it with your keyboard by pressing F4. The property grid search helps you to discover properties that you don’t really know. 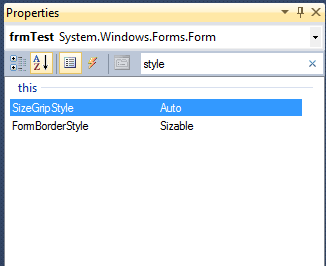 For example if you would like to examine all properties regarding a control style, you might type “style” in the search box and all properties with the string “style” in its name would have been found. 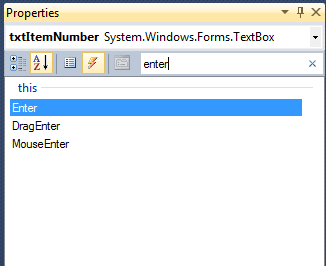 You can event type property names by using Pascal notation. For example if you type FC, the property ForeColor would have been found. By using the property grid search window you can even search for events. You can press Alt + Space to switch between properties and events. 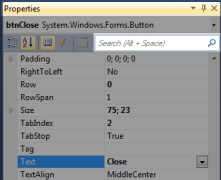 Please note that property grid search works from anywhere in Visual Studio but only with the classical property grid, commonly used within Visual Studio. Windows Presentation Foundation and Silverlight designers present a different property grid, which already has a filter bar. 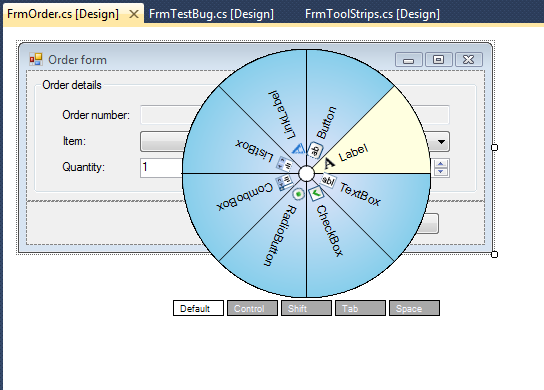 Quick-Access Toolbox is a toolbox window opened like a context menu, right above the design surface of the Windows Forms or ASP.NET designer. You open it by pressing and holding the mouse wheel, or keyboard hot-key "Alt + `". 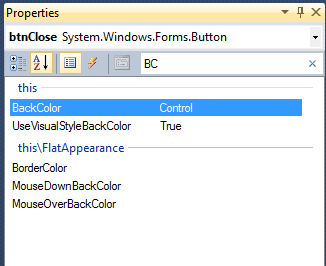 You can specify what controls should be displayed in the Quick-Access Toolbox. It event lets you group controls into control sets and display different control sets when you hold a different key (like Shift, Control, Tab). Controls in a circle - it's the fastest way of choosing a control and it works really well if the number of controls is small. You have to move your mouse very little from the center to select the desired control. Controls in a grid - it's a clean presentation even if there are many controls to show. RapidDesing can automatically change the look of Quick-Access Toolbox based on the number of controls to show. 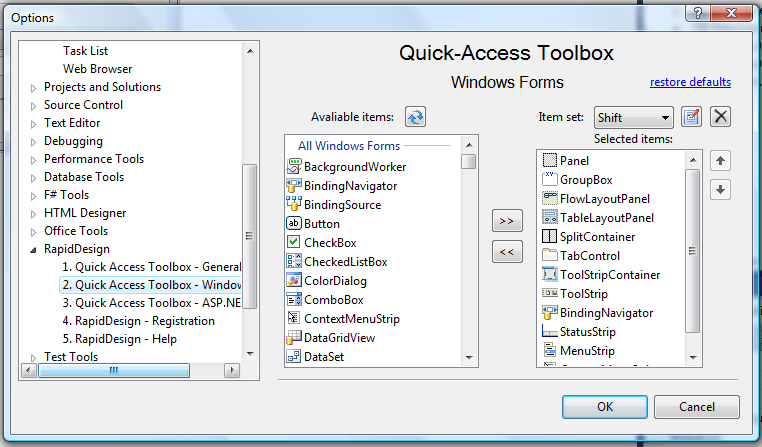 Quick-Access Toolbox is higly configurable. You can choose which controls do you want to access with it. 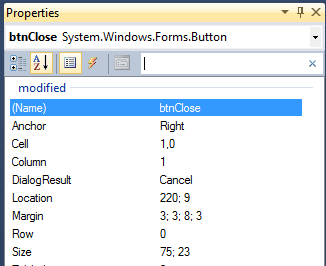 You can create, modify and delete control sets associated with a modifier key. You can even choose controls from third party assemblies, and controls from referenced projects. How much does RapidDesign cost? RapidDesign has a 14-day trial version. If you would like to use after the trial period you have to buy a license key. A single user license costs only 15$ 30% OFF: UNTIL 31st MAY RapidDesign is only $10 ! During a single day of work you can use RapidDesign more than 100 times. Think about the time and frustration can save! No more browsing through the toolbox and property grid! Enhance your Visual Studio now! Use RapidDesign after trial period! 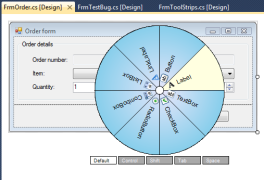 "RapidDesign is a must have for a WinForms developer. The Quick-Access Toolbox will greatly speed up your development."